About two weeks after her 15-year mate, Justice, disappeared from the nest, mother eagle Liberty appears to be moving on. 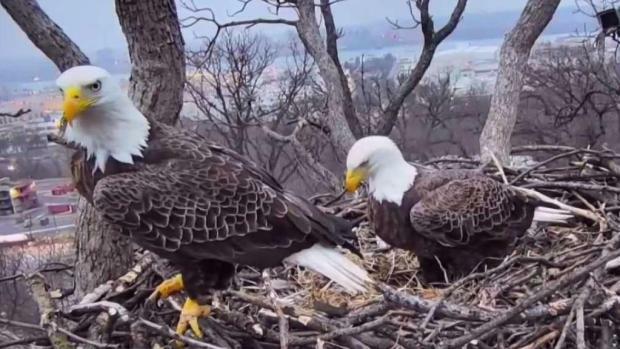 The drama surrounding a Southwest D.C. bald eagle nest is spinning into a tale of animal kingdom resilience — And a lesson on how birds could be affected by very human emotions like stress and grief. Two eggs in the nest are no longer viable, other birds are circling for a nest takeover and Liberty has mated with a new male, said Tommy Lawrence, Managing Director of the Earth Conservation Corps, which helps maintain a livestream of the nest. Before flying the coop, Liberty sat vigil for an entire night near her longtime nest, "almost grieving," Lawrence said. Justice the bald eagle is missing. He and his mate Liberty have been living near the Anacostia River for years. But now, Liberty is alone with two eggs in her nest — and a possible new mate. News4's Mark Segraves reports. Another bird that Liberty was comfortable with, possibly M2, perched directly behind Liberty and didn't sleep a wink through the night, Lawrence says. The companion was likely watching Liberty's back. With cameras showing every move, the drama is providing scientists with new data on how stressful circumstances can affect natural behavior. "There’s a lot of talk about eagle emotions and the stress levels of the eagles and how that impacts their breeding. That’s really just a matter of watching and learning from," Lawrence said. The drama unfolding in the eagle's nest has entranced raptor watchers who check in on the nest regularly, many of whom watched Liberty and Justice raise many eaglets over the years. More casual fans (and plenty of journalists) have tuned in as the once-comfortable nest situation fell apart. In the days after Justice disappeared, Liberty fended off several male suitors — Including the apparently young and inexperienced Aaron Burrd. He was cast aside pretty quickly, but the second male to come by, called M2, seemed to be a better fit. The two mated in the middle of the week. The day after, the pair left two eggs alone in the nest without incubation for nearly 12 hours. That likely rendered them unviable, meaning no chicks would hatch this spring. It was a likely outcome after Justice vanished from the nest, creating a stressful environment where Liberty had to feed herself, incubate the eggs and defend the nest from an onslaught of other birds. Citizen scientists have been gathering data points at every step, providing a look into the inner lives of eagles that would have been impossible without a camera trained on the nest. The D.C.-area eagle population is growing, Lawrence says. And that may mean that eagles see more competition for mates and well-constructed nests in great locations, like the one that Liberty and Justice built. "They sort of hard the Mercedes-Benz of nests," Lawrence said. But Liberty departed amid what Lawrence called stressful environment. An environment with more competition could end up shaking up the life cycle that eagle watchers expect: That the animals mate for life and stick to the same nest, raising young eagles together for years. It's good news for the conservation of the species, which is no longer considered endangered. The Mercedes-Benz nest will almost certainly be taken over by another eagle couple looking to hatch eggs. An eagle couple will come in and take it. There's no doubt about that," Lawrence said. "There's a lot more drama that could happen in that process." Several eagles were spotted flying in and out of the nest on Sunday. One immature eagle was spotted hanging around. And even a male and female stopped in for a while. "It's been like an eagle AirBnB at the nest. We've seen a few younger eagles move in... a 4-year-old eagle," Lawrence said. "We're waiting to see what nature has for us."